Rustington growers have faced a constant battle with the weather this year but once again, many have come out on top. 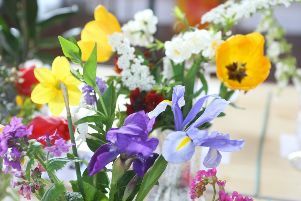 There were myriad dahlias, a plethora of fruit and vegetables and a visual feast of floral art at Rustington Horticultural Association’s summer flower show, held at The Woodlands Centre on Saturday. Alison Valentini, show secretary, said: “The prolonged warm spell meant some flowers and vegetables matured earlier than usual but even so, the numbers of exhibits were similar to recent years. “The show benches were laden with myriad coloured dahlias, sizes ranging from a golf ball to a basket ball. “The warm weather has led to a plethora of fruit and vegetables, so these classes were well supported. “Although the dry weather meant growers had a constant battle to ensure their produce received adequate water, they were obviously successful as the show benches were laden with good-sized potatoes, beans, sweetcorn and even a pumpkin so big we dare not place it on to the table for fear of breaking it. Alison pointed out the association’s first two flower shows of 2018 were blighted by two extremes of weather, first the ‘Beast from the East’ prior to the spring show in March, then start of the heatwave before the rose and sweet pea show in June. Mick Minton, Banksian Medal for most prize money in horticultural classes over all three shows, Patrick Southerton Cup for best vase of small dahlias, Ashridge Challenge Cup for vegetable collection, A Kilhams Memorial Cup for best begetable, Onion Challenge Cup for best onion, Potato Challenge Cup for potato collection, Top Vase, H F Ellis Cup for master gardener. Mick and Wendy Minton, Colley Challenge Cup for best allotment, certificate for best ten-rod allotment. Barry Cooper, certificate for best five-rod allotment. Marie Keet, Parry Silver Challenge Bowl for most points in floral art. Nick Hockey, Whitehead Challenge Bowl for most points in flower classes, Gardner Cup for two vases with two distinct types of flowers, British Fuchsia Society Blue Rosette for best fuchsia, Knight Cup for best fruit exhibit. David Stubbings, British Fuchsia Society Bronze Medal for most points in fuchsia classes, Certificate of Merit for best gladiolus, Bruce Cup for most points in gladiolus classes. Alan Humphrey, certificate for most meritorious exhibit in flower classes, Williamson Cup for most points in dahlia classes, National Dahlia Society Silver Medal for best dahlias and National Dahlia Society Bronze Medal for second best dahlias. Fred Spanton, National Dahlia Society Bronze Medal for best dahlia exhibit from those with less than 30 plants. Martin Kempson, certificate for most meritorious vegetable exhibit, Top Tray, Leggett Challenge Bowl for best overall exhibit in flowers, vegetable and fruit classes. David Donovan, Cookery Challenge Cup for most points in cookery classes. Abi Pendleton, certificate for Junior Masterchef Award, Molly Hartley Cup for most points in junior classes over all three shows. Tony Welch, Hands Memorial Cup for most points in rose classes, Oliver Cup, best rose. Other first prize winners: Agnieszka Bednarska, Julie Churcher, Glynne Collins, Sylvia Hesling, Sarah Hill, Isabelle Layt, John Luxford, Margaret Maroney, Valerie Narayanaswamy, Kathy Oldfield, Carmel Pardi, Jenny Starns, Alison Valentini, Claudio Valentini and David Maitland.